Eyewear Repair Kit (SCR08) contains screwdriver, tweezers, large variety of screws, small cloth and self adhesive sponge nose pads. Both kits are suitable for repairing Sun and Prescription glasses. Eyewear Repair Kit (SCR07)Handy little repair kits for bag, desk or car. 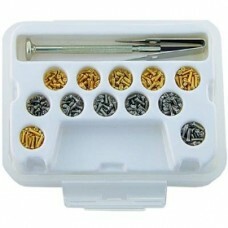 Screwdriver Repair Kit contains screwdriver, self adhesive silicone nose pads, washers and small selection of screws. Handy little repair kits for bag, desk or car. Screwdriver Repair Kit contains screwdriver, s..
(SPP03) SPONGE NOSE PADS Self adhesive sponge nose pads designed to stick on to existing nose p..
(SCR05) MULTI SCREWDRIVERS Multi screwdrivers have four interchangeable ends featuring Fl..